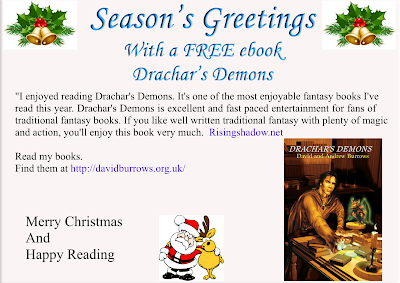 FREE for Christmas - Drachar's Demons. A fantasy tale. Yule love it! Treat yourself or a friend to a FREE e book for Christmas. Click here to go to the free download page. 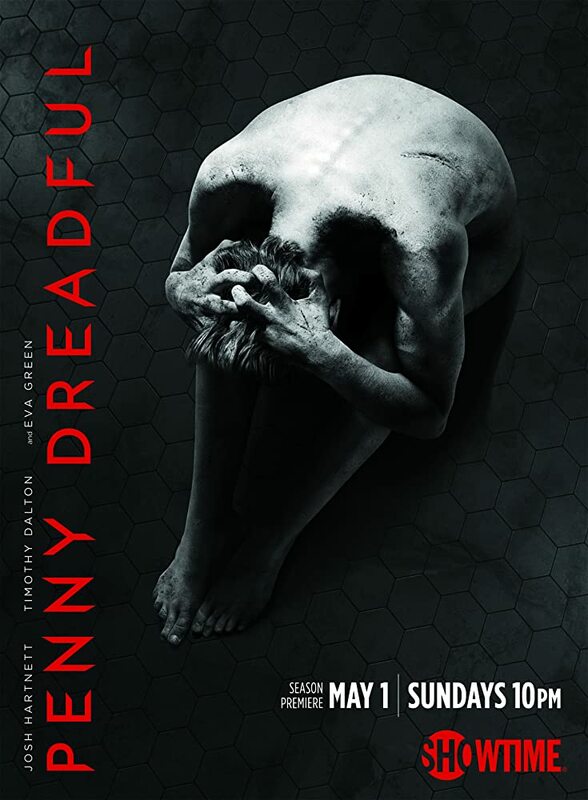 Season 1 for me was well...dreadful. It was long winded and dull. However Season 2 is far better. The tale of witchcraft has brought the series alive. This programme had all the hallmarks to be great with vampires, witches, monsters etc. However, Series 1 seemed to lack for a story line. It was as if the produces had thought, as an example -- let's do an episode on possession and the story line was pinched from The Omen. There were dull moments where too much emphasis was placed on convincing the audience about the passage of time. However, in Season 2 there is much more action. I was worried though, that Frankenstein's female monster would be a rehash of previous tales but so far the tale is developing nicely along its own path. I like the way Frankenstein, Dorian Gray and other notary characters flit in and out of the tale. It's like meeting a long lost friend...or at east an unfriend, as these characters are so mixed up and likely to do you harm. OK I am well behind most people on these Seasons but if you are like me and uncertain whether it is worth watching, it is worth a try. FREE ebook: Drachar's Demons. A fantasy tale available from iTunes, NOOK and KOBO. 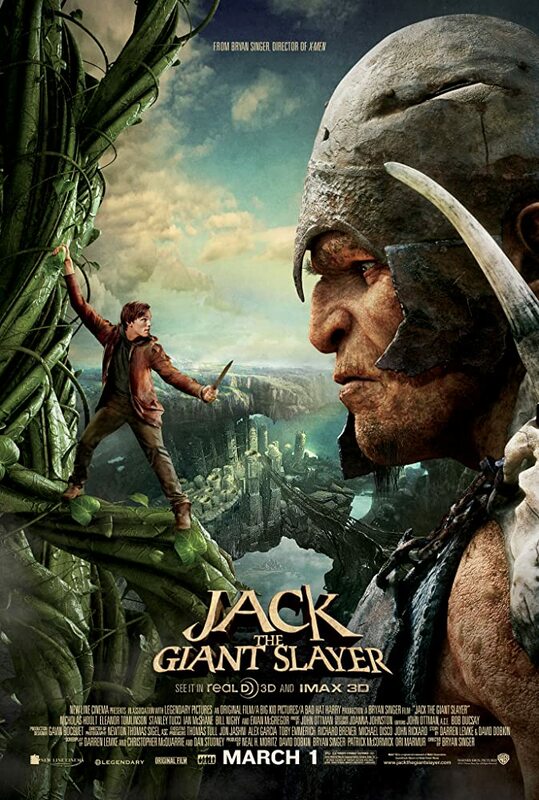 OK, as far as Fantasy films out there this is a bit of hokum, but actually a good fun. The giants are definitely the best bit and quite a bunch of characters there are too. With their manners, you certainly wouldn't want one cooking your dinner; a little too like the trolls in the Hobbit. It is the usual tale of Jack and the Beanstalk but with some twists. The cast is good on the whole although Ewan McGregor gets a bit annoying after a while with his plum-accent. Eleanor Tomlinson simpers through the role nicely, but her co-star, Jack - Nicholas Hoult, could have been better cast as he comes across too nerdy/whimpy. As I say, the best bits belong to the giants and it is worth watching just for these. It's a bit like the Minions in steroids and with attitude. Good fun, especially how Jack deals with the giant chieftain. Awesome. For All Those Detectorists Out There. “Why are you crying, Guthrum?” Alfrec asked. Guthrum was a picture of misery, sitting amongst the hedgerow, his knees to his chest. His threadbare tunic damp from his tears. “Dad is going to kill me,” Guthrum snivelled, wiping his nose with his sleeve. “I won’t let him,” Alfrec replied and Guthrum choked on a half-sob, half-laugh. “What have you done?” Alfrec asked, sitting alongside his brother. The day was warm and the sky clear. It was almost pleasant sitting in the dappled shade. “Where did you lose it?” Alfrec asked. Guthrum snorted. “If I knew that I wouldn’t be sitting here.” Alfrec cast Guthrum a glance that suggested the reply was unhelpful. “Empty your pouch and let’s check,” Alfrec offered. Guthrum upended his pouch and his worldly belonging spilled out onto the damp grass. “What’s that,” Alfrec asked pointing at one object. “Well I would get rid of that. It clearly hasn’t helped.” Alfrec said. “No sign of the coin then. Can we steal a chicken?” he suggested hopefully. The two boys sat in silence, neither wanting to hurry toward the dreaded encounter. Jack grinned. “Bloody hell,” he said with a whoop. His detector had given him a faint signal and now a glimmer of silver stood out in stark contrast with the black loamy soil. His fingers scratched at the dirt revealing more of the object. “What u got,” Kev asked, coming over and laying his own detector down before removing his headphones. Jack stood and promptly started his hammie-dance. “Oh yes! Oh yes!” he chortled as he circled round his friend. Kev grinned, “Great find, mate. This’ll be find of the month.” Neither men gave a thought to the lad who had lost it and the beating he took from his irate father ad if Guthrum had been alive to see Jack’s hammie-dance, he would have groaned to see such peculiar cavorting by a grown man. Very entertaining but very slow. I didn't mind the slow read in some respects at it is a fascinating read and the author conveys 12 century England so very well. The tale (once again) involves boats and sailors, but has an interesting undercurrent from piracy. John de Wolfe is an absolute saint, I would have murdered his wife many times over. I love the tale being centered on Exeter and you can certainly recognise the cathedral and grounds and many of the road names rang a bell. Drachar, banished by his own people, forges an unholy alliance with the demons. They demand one hundred thousand souls and only all out war will deliver so many and Drachar must seek allies. Meanwhile his people, the Eldric, must learn to counter the growing threat. Only the bravest sorcerer dare summon a demon, let alone learn to defeat one for failure will result in their soul eternally damned. 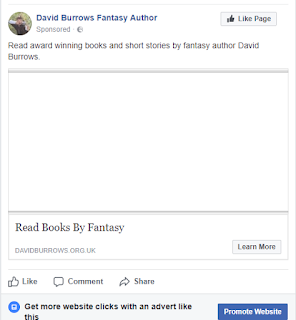 David Burrows is the author of the award winning fantasy trilogy the Prophecy of the Kings (Gold Award 2010 Readersfavorite.com) and the prequel Drachar's Demons. Prophecy of the Kings was also Book of the Month on SFbooks.com. 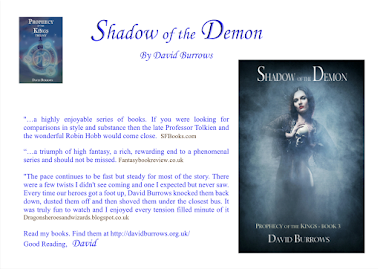 Sample chapters and reviews can be found at David's website http://davidburrows.org.uk/. 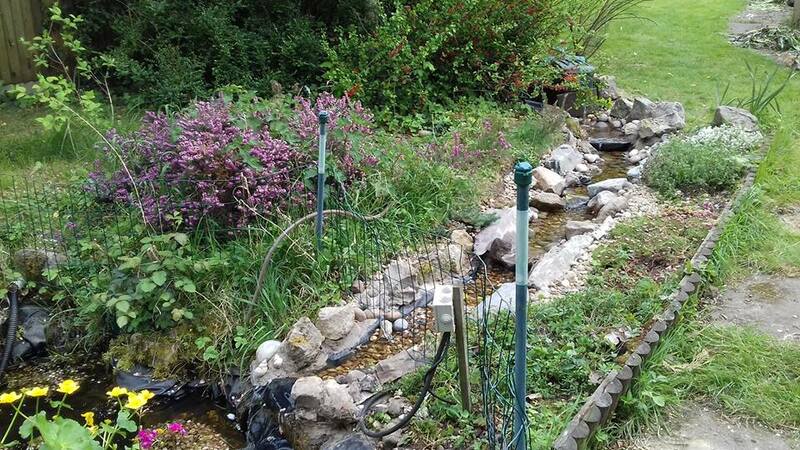 David has lived in Blackpool, Liverpool, Edinburgh and he now resides in the garden of England, Kent. He was a Captain in the TA (2/52 Lowland), an experienced mountain climber and more recently has taken part in Saxon/Viking re-enactment. 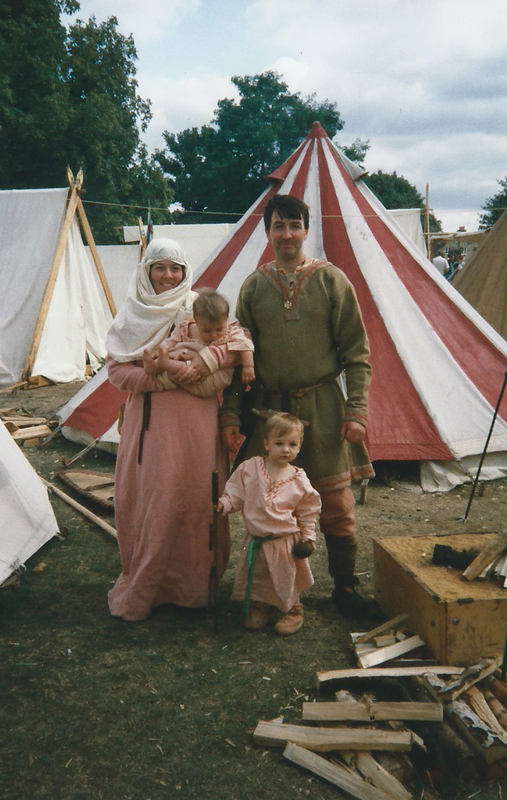 David's fantasy writing has benefited from these real life experiences: hours slogging up and down mountains and fighting in a shield wall and although never maimed or killed, David has broken bones on several occasions, so the fighting at times has felt very real. As with most aspiring authors, David's writing is part time, with the plots progressing in the evenings and holidays and also during his wife’s pregnancies. At times David's tales seemed to naturally take the characters into extreme peril, and for months he was left wondering as to their fate. Refusing to rewrite the tale to rescue them he patiently waited before inspiration struck and the story continued at a fast pace to the next cliff-hanger. Suffice to say David's two sons have now grown up and, as the quill dries, are of an age to read and appreciate this work and to develop their own writing. As to the characters in David's tales, they too have grown older and wiser; as to whether they survived the tale, only reading the novel will tell. Of course I love Tolkien and Lord of the Rings. My favourite of his works, however, is the Silmarillion. That's a truly a wide sweeping epic, spanning generations.it's a difficult book to get into but some of the tales are brilliant. I also like David Gemmel's Legend. That helped to inspire me to write. I loved Druss as a concept and he seemed to be so real. I enjoy reading and modern authors have added gritty reality to fantasy. I like Brent Weeks, Joe Abercrombie and George Martin in particular, but unfortunately these authors came too late to influence me. Although I enjoy the gritty reality in their tales, I still like traditional fantasy. A tremendous book I recently read was the War of the Fae by Elle Casey. The first book I read was probably Edgar Rice Burrough's Mars series. He wrote to a formula, the hero falls in love, The girl gets captured and the hero sets out through an alien world to find her. He also wrote Tarzan which are brilliant books. I also read Dune and Lord of the Rings and the latter certainly had the biggest impact, but i still have a soft spot for the Mars series. They were written in about 1910!! I grew up near Blackpool which was a great place to be, as a student. I had plenty of jobs in the area including; bingo calling, a horse racing game on the prom, theatre hand, working at Blackpool's Pleasure Beach, amusement arcade attendant, working on farms amongst others. They helped me to gain confidence and to people watch, to build characters for novels. The area was also close to the Lake District and I went mountaineering a lot, which helps writing scenes where characters travel over rough terrain and in inhospitable conditions. I was also in the cadets, TA. and a Saxon/Viking re-enactment society and that was truly epic in understanding fighting with a sword, shield and spear. 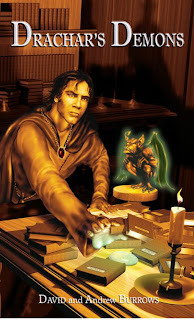 My latest book, Drachar's Demons, is fantasy and is about an Eldric Lord called Lothanol. He is caught spying on the demon world and his people suspect he is trying to make a pact with the demons. In my book, sorcerers use the spirit world for their magic and elementals such as air, fire, water and earth are the basis of their power. Lothanol discovers imps (lesser demons) and he learns to increase his power. Through the imp, he also learns to summon more power via demons. They are incredibly difficult to control and the risks are immense. His people cast a spell on Lothanol and banish him. However, he influences their spell and the pact with the demons is made. He promises them 100,000 souls and only all out war will deliver so many. Drachar's Demons is the prequel to the Prophecy of the Kings. Some of the ideas in my book came from our own history and periods that interest me. The main theme of my novel is a race of people called the Eldric. Their legacy was very much like the Roman legacy is to us, today. We have Roman ruins that tell of a dominant race of people who ruled at a time when most other societies lived in wooden buildings. I wanted to create a sense of wonder and of superstition. 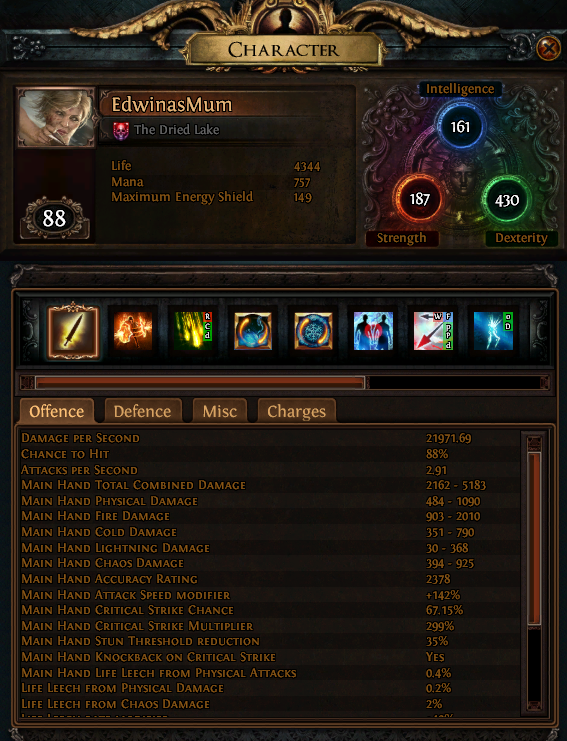 I achieved this using the Eldric's mysterious disappearance and the cyclic demon threat that occurred every 500 years. This made the people’s superstitions real, but vague as they didn’t record their history. I also looked to our Saxon heritage where people were much more likely to believe in imps, fairies and dragons as they lived so close to nature. I liked that sense of naivety. We all have a huge sense of wonder that stems from our childhood and I wanted to capture that, but in an adult world. An excellent read akin to Stephen Saylor's Gordianus the Finder series. The style is similar as the the premise. However, rather than a murder mystery in Roman times it is set in Elizabethan England. The author conveys a great sense of the period with its slums at one end of society and nobility at the other. Treachery is set in Portsmouth with Sir Francis Drake about to lead an expedition to the New World for plunder. However a suicide on board requires investigating and Bruno, an Italian philosopher is on hand to delve into the seedy depths of Elizabethan Plymouth. The scrapes come thick and fast for an excellent read. Excellent book, but borderline historical fiction and tending to fantasy. Still, an excellent read. This is the fourth in the series involving Taita, the once slave who is now more of a mystic/warlock. There's lots of mysticism and set in ancient Egypt that works really well but the reader has to suspend some belief. The journey is certainly epic as Taita seeks the source of the Nile and the reason for years of drought. There's giant, killer toads and an ancient goddess to contend with. Smith's descriptions are beautiful and his knowledge of Africa brings the books alive. A great read for historical fiction (with some tongue in cheek) and fantasy fans alike. An Excellent Read: Conn Iggulden's Stormbird: The War of the Roses. An excellent tale which brings to life how the War of the Roses started. It is clearly a complex time and the prologue nicely sets the scene: Edward the third's death bed and several of his sons hovering in background, already plotting who will rule. Iggulden does a great job of bringing clarity to what is a confusing time. History books can be very dry but a well written historical fiction can add a huge extra dimension, making the period come alive. The historical note at the end provides a glimpse into fact versus fiction and I think Iggulden does a great job of steering between fact with intriguing fiction. This is a great period of history that Game of Thrones can only emulate. It has the same sense of betrayal, political motivated murder and great characters determined to succeed. There are epic battles seen from the point of view of either Lords or lowly archers. A great tale. If you want to read about men clashing in heavy armour this is a good read. It does drop off after a great start and the tale fixates on domestic life. It is still readable but a bit slow. When it gets going again there is some great action. Set some years after the battle of Crecy it follows Thomas Blackstone's adventures. He was an archer at Crecy and for his actions, becomes a knight. The tale has its bitter sweet moments which make it all the better. However, I often heard myself saying foolish woman to one of the main characters as once again she puts herself in harms way. I will be reading the next installment. It is harder than it seems to make a tale believable and hats off to fantasy writers who manage to achieve this despite fanciful creatures such as dragons, demons, elves etc. But, strangely, authors in other genres also sometimes fail to make their world believable. I have given up on several historical fiction books, because they simply don't feel right. A recent novel about Rome was written in a modern style and perhaps that was what the author intended, but for me that failed utterly. An Egyptian novel I read focused on a few main characters and didn't mention anyone else. It felt lifeless whereas a Wilbur Smith tales, set in the same period, had a cast of thousands and felt more believable for it. This was achieved in a few sentences, adding to the clamour of life. In all writing, I feel that you should be able to see, smell and even taste the world that you are in. The author needs to translate their knowledge of, say, ancient Rome to the reader and that means following their characters through crowded streets, filled with everyday folk and with ex-gladiator guards forcing passage for some high ranking noble, vendors screeching out their wares of Garum, pots and pans etc. and the smell of open sewers competing with that of roasted dormouse. The clothing, the food, the sights and again the smells are ways of convincing a reader that the tale is real. In the most challenging genre, fantasy, how then do authors achieve believable tails? In my view it is characterisation that often achieves this. Also, no tale should have an easy and obvious solution, like a wizard destroying everything in his path. Characters need to be vulnerable in some way. Gandalf in Lord of the Rings is a great example. He is a key character and yet he is flawed in so many ways, e.g. blind to Saruman's deceits and facing a balrog, his best defence being a spell to block a door; a simple and yet effective use of magic. There is never a fiery blast that destroys thousands. Fantasy and Sci-Fi tales must have bounds and rules. Star Trek was awesome and the rules there were not too far fetched and some even have become common place in modern society. For example, communication devices that fit in the palm or lapel. The more extreme deviation from modern life were energy shields, Warp engines and matter transporters. Their description and manner of employment, however, made them convincing. Each technology had believable faults that we could relate to e.g. a planet's atmosphere interfering with comms, energy shields that could withstand only so many hits and drained power, and matter transporters that simply failed (as in being spliced - Harry Potter books). In fantasy the same issues of vulnerability help to make the tale believable. In Lord of the Rings Smaug has a displaced scale, making him vulnerable while his insufferable ego and greed add to his character. Having a well thought through history of your world also makes fantasy and Sci-Fi believable in the same way as historical fiction needs a background setting. For example, readers need to know why a battle is about to happen, or the politics of races that set them apart. Why, for example, did some races embrace Rome and yet some defy her? Making tales believable is key to being a good author. I do hope that in my tale, the Prophecy of the Kings, I achieve that despite such strange creatures and settings. I went to Rome recently and loved it (apart from all the walking!!). Ancient Rome is everywhere and for me that has strong links to fantasy writing. With all their gods and superstition, Romans did nothing without consulting an oracle. (Not a job I would like: examining entrails for signs of a diseased liver.) Their gods were a dangerous and self-serving lot, demanding the best sacrifice and huge temples with columns that dwarfed any building that had gone before. Man finally lost himself in Rome's grandeur and emperors declared themselves gods, perhaps following Egypt's millennium-old example. Nero built a huge statue of himself and unfortunately the Colosseum replaced that. For all their mortal failings, declaring yourself as a god must be the height of power. And folly. In my books I tried to capture ancient Rome's grandeur and more importantly mystery. In Britain, long after the Roman's departed, people must have looked on in wonder at the ancient remains of amphitheaters, temples and other grand structures. In an age of wooden buildings, Roman ruins must have seemed god-like and may have fired people's imagination. In ancient times, superstition was rife, and the embers of people's fear were likely to be fanned by ancient places dedicated to lost gods. The Eldric are a race in my books who mysteriously disappeared, leaving behind the ruins of once proud cites. Their civilisation was like Rome's, far above that of the indigenous population. In my books the threat of demons adds to people's superstition and the fear of a demon materialising from the underworld, to seek souls for eternal damnation, is too great to be voiced and like Roman remains, gargoyles and symbols decorate the ruins as wards against evil. A view across the Tiber: Nero's mausoleum. One of the many paintings decorating a church ceiling, Staggering. OK, not a fantasy book for a change, but quite a good read. It's along the lines of Dan Brown's da Vinci Code although few books (if any) quite match that level of writing and imagination. Nonetheless, this is interesting and set around Stonehenge. It's a thriller set in modern times and the female detective looking in to the case is believable and comes across well in both narrative and characterisation. The tale is based upon the kidnap of a wealthy American girl and her parents' (both influential Americans) attempts to get her released. However, the kidnappers aren't interested in a ransom and the dark side of the tale is that the girl is to be part of a ritual. A very dark one at that. The race is on and the police must find her, however all but a minority of people understand that the case is not about ransom. The symbology and suspense works well with Stonehenge as a background. On the minus side: the ending feels rushed. The major players in this book had to slowly come together, form a group, and set off on a quest. The mythology, various landscapes plus other bits and pieces of worldbuilding needed to take place so the reader could acclimate to this new world. An abundance of familiar tropes were used but unlike some, tropes used intelligently do not bother me in the slightest. But then I still read and reread all of David Eddings' early books and they don't come any tropier. (Is that a word? If not it should be...) All in all I was impressed with how much story took place. 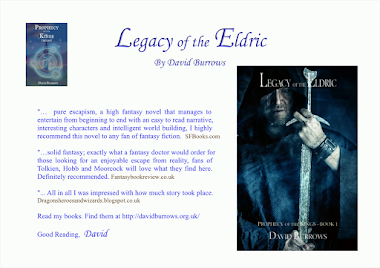 Legacy of the Eldric is a book that's hard to put down. Mystical tale filled with fantastic action scenes, dragons, 3 princes, wizards, astral travelling, demons and tree spiders! Burrows has written an amazing epic fantasy that will have you glued to the pages. The author is a fan of LOTR and his trilogy is in a similar vein, yet is filled with original ideas that are unique to Burrows. 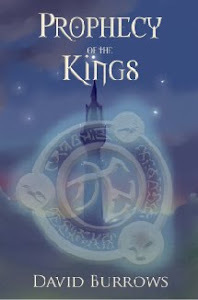 This amazing book and its sequels are a must read for all fans of fantasy lands and epic battle scenes. I finished this book over a month ago but I have not forgotten how gripped I was by it. The story starts in an understated and unpretentious fashion but before you know it you're hooked! Kaplyn, the central character, is a likeable young man for whom the reader cannot help but feel some affection. He and his travelling companion, Lars, gain more depth and personality as their characters mature through their many challenges and experiences. There's never so good a lesson as one learnt through hardship and adversity. This book provides the young men with plenty of opportunity for learning life's lessons. I found it difficult to put the book down, then was cross with myself for not making it last once I'd finished it! I recommend this book, but be warned; you'll be reaching for the second book in the trilogy as soon as you've finished this one! It was suggested to me that reading fantasy fiction probably wasn't for me, but I really found myself drawn in to this book. The fact is that most people read this sort of book in their teens and this for me was a great kick to the imagination - very easy to immerse myself in. What made it enjoyable was the depth of the story, which works on a few levels. There are subtleties peppered throughout that came together like a jigsaw puzzle about half way through the story and together with good main characters kept me interested. 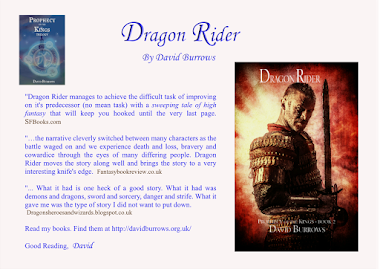 I'm off to download Dragon Rider now to see how the trilogy develops. 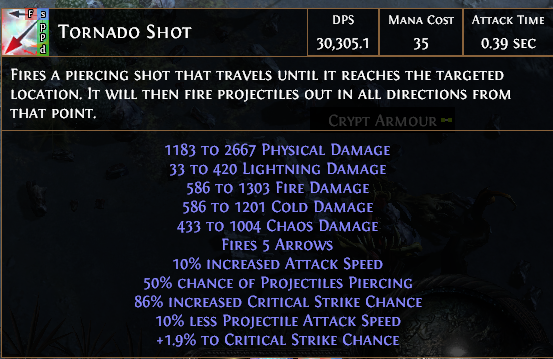 The Legacy of the Eldric was a book I didn't want to put down. I always felt something exciting was going to happen on the next page. I enjoyed the development of the characters and the strong plot. The book ends in a way which makes you want to start the second book straight away. Ever since I was a dalek (I'll explain later), I've like dressing up. As a child my favourite outfit was an American cavalry uniform straight from some John Wayne western. Once I was told to fetch my father from the pub, I was about 7 at the time -- honest, and I went in a dalek costume. I was a very serious Dr Who fan in those days. 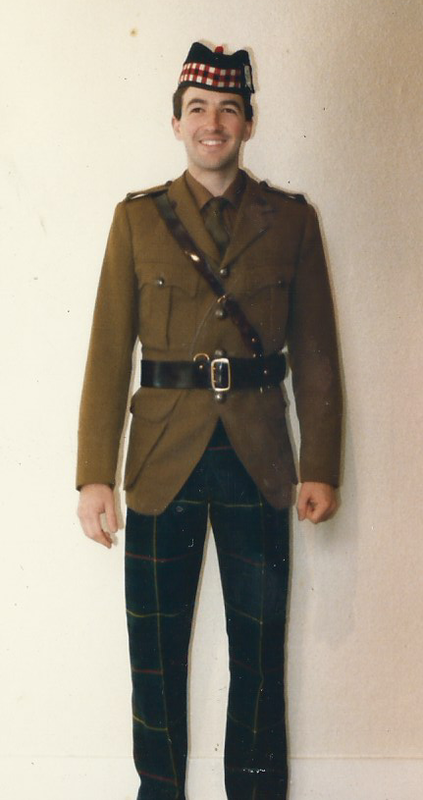 Unfortunately dressing up seems to have become a thing over the years, firstly as a cadet at school and then in the Territorial Army. 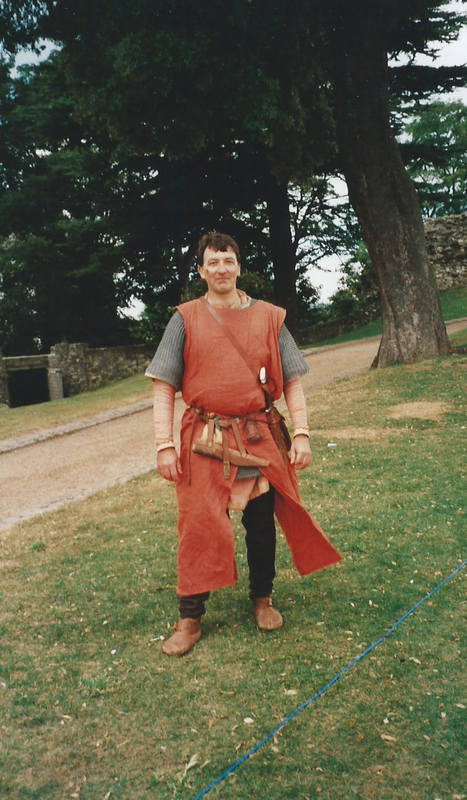 One time, at a Saxon event in York, I said I'd meet my wife in BHS (a large department store) and I wandered in in full war gear carrying a very large shield and a nine foot spear. To my horror, turning around looking for my wife, I heard a ting. Looking around I was in the lighting section. With my spear and shield, each time I tried to turn it looked like I'd break a hanging lamp or some such. I was mortified and beat a hasty retreat. My strangest experience losing a lens was when ice climbing Ben Nevis (Tower Gully). A friend, Andy, and I were climbing late in the season and occasionally you could hear a crack and whoosh as ice broke off. This was a grade 1/2 climb as there was a cornice, overhang of ice, at the top which we had to dig through. I wasn't very experienced at climbing, but initially everything was great. I don't like heights, but the crampons and ice-ax made me feel secure and we climbed steadily for 30-40 minutes. I was wearing gas-permeable contact lenses and blinked just as some ice went in my eye and...pop...out went a lens. "Hold on,Andy," I said. "I've lost a lens." Andy was above me and he dutifully stopped. "You've lost it," he grumbled, pragmatically. 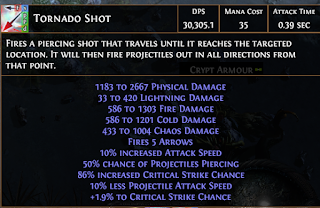 "no chance of finding it now." He was from Yorkshire so a man of few words. We were, at this point, on a very steep slope (70 degrees) about one thousand feet above the ground. He was probably right, but as contact lens wearers are aware, lenses are too expensive to lose. Looking around the slope I spotted the lens almost immediately to my front. It seemed glued to the ice and small particles of snow were being blown across the surface. I was terrified the lens would also blow away, but watching the small grains being blown over the surface was quite hypnotic. Fortunately, the lens was grey (the right lens is often grey to differentiate left (clear) from right) so it actually showed up quite well against the blue/white ice background. I looped my arm through the strap of the ice-ax which was reasonably anchored in the ice, took off my mitt and carefully extracted lens from surface, realising that it had actually frozen to the surface. Wow, incredibly lucky and saving me nearly £100. I put the lens back in and was ready for the climb. Higher up and Andy yelled down that he had hit water-ice. This makes climbing very tough as the ice shatters when you strike with the ax which barely forms contact and certainly not enough to trust your weight to. We had to descend with the plan being to traverse across the slope and try again. This was awful. Looking between your feet at a thousand foot drop brings home the precarious nature of the situation and suddenly vertigo becomes very real, as does disco-knee. However, I realised I had no option, so overcoming my fear down we went. I have never been so afraid. I realised just how vulnerable we were perched so high with a few millimeters of metal of the crampons and an ice-ax for purchase. Dropping about one-hundred feet, we traversed across and continued on up. Climbing up was less fearful, but after the recent scare my heart was beating for England! The next heartache came near the summit. Andy had to borrow my ax whilst I sat inside the ledge beneath the overhang of ice. The view was incredible but very, very scary. Andy chipped at the cornice, making a tunnel for us to crawl through. He held on with one ax and chipped with the other. 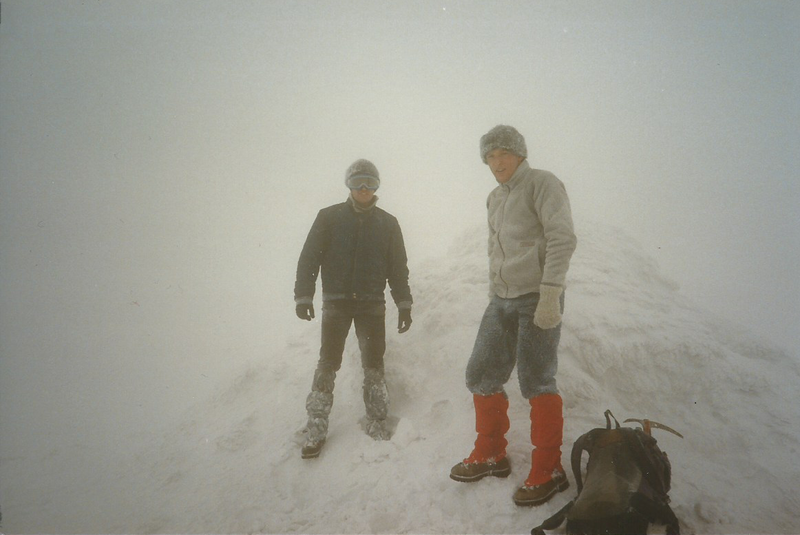 We managed to crawl through and upon gaining the summit we swiftly realised that we were standing on an overhang of ice a few feet thick and beneath that was a sheer drop. We moved very swiftly on to solid ground. What an experience and what a tale to tell. Losing a contact lens and reinserting it on ice pitch. Incredible, but not for the feint hearted. Andy and I in a White Out (Ben Vrackie I think). Andy looks cold! Hallam ducked beneath the blow, pushed his left foot forward, grunting with the effort and hacked sideways with his sword. Something hard hit his shield and if he hadn’t put his foot forward he would have overbalanced. The fight raged around him. Men and krell dying in their hundreds. Hallam screamed a war cry and pushed against the line of enemy, seeking to dislodge a foe and open up their shield wall. Krell pressed hard against his shield, hoping to achieve the same aim. “Hold the line,” he commanded, sensing a slight movement to his left. A line that went backwards was already defeated. A spear glanced off one of his greaves and he stamped down hard trying to snap the shaft. Warm blood flecked his face, causing him to blink. The copper stench in his nostrils nearly made him gag. “Push,” he yelled, trying to get his line forward. The author pushed back the keyboard and leaned back. Time for a cuppa. He went to the kitchen and turned on the kettle, reaching in to the cupboard for a teabag. Humming softly, he filled the cup and stirred clockwise before settling on a couple of chocolate biscuits as a treat. Sitting in front of the monitor once more, he dunked a biscuit. He shivered and glanced at the thermostat. “What the hell,” he muttered dialing up the warmth. His slippers were new and fur lined, a rare treat and kept his feet beautifully warm. Stig, an orange and brown cat mewed playfully to one side and the author tapped his leg, allowing the cat to jump up and settle on his lap, purring softly. Outside the sky threatened snow, but the author barely glanced that way. Hallam groaned, recognising the fearful cry from the darkened sky above, “Grakyn,” he screamed, hoping that the archers to the rear could see in the half-light. The battle was going horribly wrong. He prayed to all the gods for a change in fortune. This is oversold in my opinion. 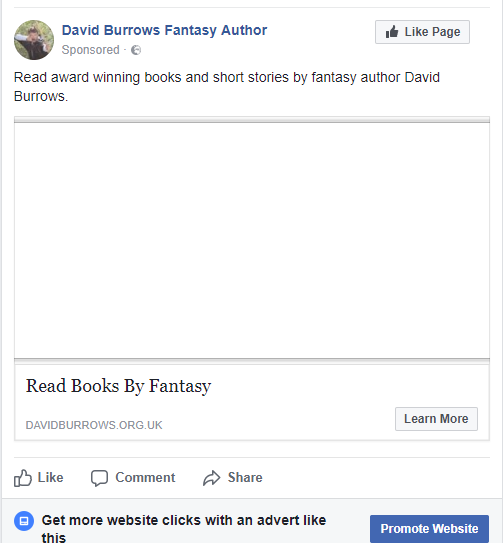 Facebook has a limited catchment and if you believe other posts this is deliberate to make people spend on advertising. What I've heard is that Facebook messages don't even appear to all your contacts and it can the percentage of people who see your post can be quite low. Twitter does seem more helpful and hashtags are very useful as these put your post on various lists. For authors the following hashtags are useful, but are not exclusive. I'm sure there are many more so feel free to add to this list. However, Twitter posts scroll very quickly down the page so disappear from view fast. Aboutme is a useful page to have and people look at this site without doing to much work. LinkedIn is mainly about seeking jobs, I think. I am on that but not very active on that forum. My blogs are setup to always post on Google+ but that is one site I rarely hear from. Pinterest is useful but the information you can post is limited, unless I am doing something wrong. My experience is that Social Media is nice to have but won't necessarily drive lots of people to your website. Facebook messages, for example, will appear in front of the same people over and over and it is likely that, unless the message changes, they will become bored of it. I haven't yet spent money on advertising on Facebook but from the response from other people it is not always money well spent. I am not advocating not using social media but pointing out that expecting instant traffic is unlikely and one problem is you can commit a lot of time to it for little reward. One irritation I have is there are lots of posts on the Internet about book marketing and many spout lists of things you must have such as an author's website and being active on social media. That is so easy to say and yet how to direct traffic from these sites is actually very hard and at that point the advice dries up. My Two Top Romantic Fantasy Films: Does This Make me Soft? OK, weird subject but what the heck. Weird in the sense that Fantasy ought to be heroes bashing goblins or at least slaying the odd dragon. Not that the dragon has to be loopy-odd, just rare-odd. Bringing romance into fantasy has its place of course and a hero rescuing a damsel in distress, such as in Shrek, has plenty of room for development. My two top favourites are Beautiful Creatures http://www.warnerbros.com/beautiful-creatures and Stardust http://www.imdb.com/title/tt0486655/. Groundhog Day sneaks in for comedy element as a distinct runner up. I only saw Beautiful Creatures recently and whereas it's not alone and other films have followed this line, such as Twilight, I found Beautiful Creatures to be less pretentious and quite refreshing. The CGI magic sequences were very well done. The plot rocked along at a gentle pace and hooked me from the start. 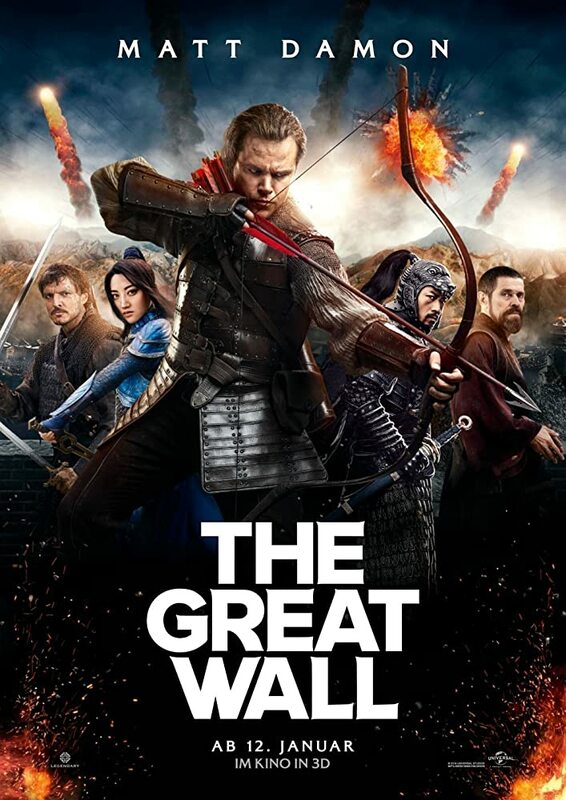 The characterisation was good and Jeremy Irons played a great role. I thought Alice Englert was suitably gorgeous to entrap a young man's heart. My favourite film still remains Stardust. It's the rare occasion when a film is better than the book. The humour is well done and I'll always remember bubbling candles. The scene in the first fantasy market was great and showed tremendous imagination in the film makers' minds. Like Harry Potter's Diagonal Alley, I could wander around there for hours. Great films and we want more. Considered weak and ineffectual by sorcerers, a wizard's power comes from within them. Only those born with a "well" for magic inside of them can become a wizard. The deeper the well the stronger the wizard. Sorcerers, however, are much more intriguing. Sometimes described as necromancers, they gain power through the spirit world. The simplest spells are cast using elementals, such as fire, water and air among others. More powerful magic is cast via demons and the lowest form of demon is an imp, a sly, small creature who carries plague for his more powerful cousins to reap ill in the world. So which is the stronger? A wizard or a sorcerer. That depends on the sorcerer's abilities. 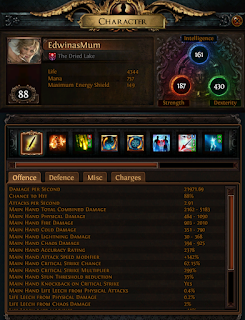 Most rely on elementals for their power, as dealing with demons, even imps, comes at a price. A minor slip and the demon will take your soul screaming to Hell. The strongest sorcerers have incredible abilities...if they dare tap into the power of the most powerful demons that is. Such a summoning is very complex and the sorcerer has to match the demons strength...or suffer the consequences. However, Wizards are not as inept as sorcerers like to believe. A wizard with a kara stone can cast very strong spells as kara stones are a deep well for magic. Kara stones are very rare and only the most powerful wizards jealously guard them...with their lives. This sets the scene for the Prophecy of the Kings. Throw dragons in to the melting pot and the land becomes very dangerous indeed. Follow Kaplyn as he strives to stay one step ahead of Vastra, a self professed sorcerer in a land where few now exist. Vastra, a bitter man with a dark secret for which he will kill to protect.